Access to your AIB accounts is now easier than ever! Follow the directions below to learn how to download the AIB app for your IOS or Android phone. Touch ID or PIN authentication- Easily and securely log in using fingerprint or a personal identification number. View balances and account activity- Search for transactions, add a note or an image, and filter by tags. Understand your activity and find what you’re looking for—fast. 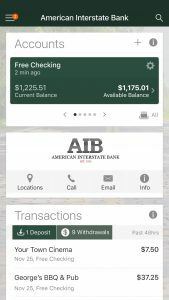 Make mobile deposits using your camera- Deposit checks into qualified accounts using the mobile remote deposit feature. Mobile bill pay and person-to-person payments- Pay bills or send money to friends and family quickly and securely. Transfer funds- Effortlessly initiate one-time, future date or repeating transfers. Personalize your app- Arrange the app’s features in a way that makes the most sense to you—customize the app on a per-device basis and move things around however you like. 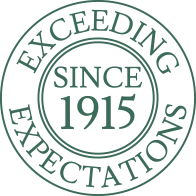 Branch and ATM locations- Find the nearest ATM or locate a branch using your current location. 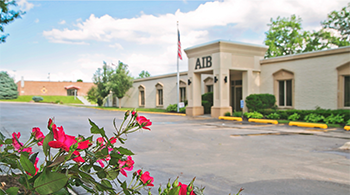 Founded in 1915, American Interstate Bank is still the only bank chartered in Elkhorn. Today, we remain committed to Elkhorn and the Western Douglas County area through our support and involvement in various service organizations, churches, schools and community projects.